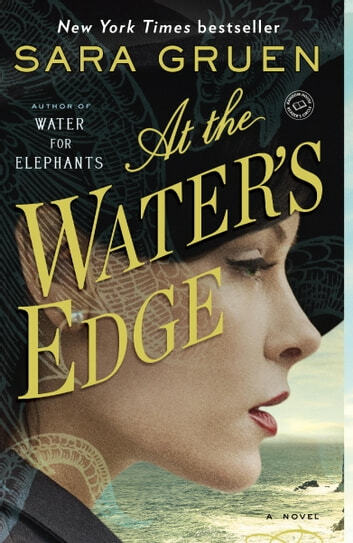 NEW YORK TIMES BESTSELLER • In this thrilling new novel from the author of Water for Elephants, Sara Gruen again demonstrates her talent for creating spellbinding period pieces. At the Water’s Edge is a gripping and poignant love story about a privileged young woman’s awakening as she experiences the devastation of World War II in a tiny village in the Scottish Highlands. After disgracing themselves at a high society New Year’s Eve party in Philadelphia in 1944, Madeline Hyde and her husband, Ellis, are cut off financially by his father, a former army colonel who is already ashamed of his son’s inability to serve in the war. When Ellis and his best friend, Hank, decide that the only way to regain the Colonel’s favor is to succeed where the Colonel very publicly failed—by hunting down the famous Loch Ness monster—Maddie reluctantly follows them across the Atlantic, leaving her sheltered world behind. The trio find themselves in a remote village in the Scottish Highlands, where the locals have nothing but contempt for the privileged interlopers. Maddie is left on her own at the isolated inn, where food is rationed, fuel is scarce, and a knock from the postman can bring tragic news. Yet she finds herself falling in love with the stark beauty and subtle magic of the Scottish countryside. Gradually she comes to know the villagers, and the friendships she forms with two young women open her up to a larger world than she knew existed. Maddie begins to see that nothing is as it first appears: the values she holds dear prove unsustainable, and monsters lurk where they are least expected. As she embraces a fuller sense of who she might be, Maddie becomes aware not only of the dark forces around her, but of life’s beauty and surprising possibilities. This book is crammed with wordy filler, simply to make it long enough to be a novel. In truth, there isn't enough substance to make a compelling short story. I can't believe this is the author's fifth book. I suspect it was actually her first novel, rightfully rejected many years ago. I would not have finished reading it, except that it was a book club selection. Not a compelling story. It read like a romance novel with a touch more sophistication, even suggesting elements of the supernatural. The one or two surprises were forced. Not nearly as compelling as "Water for Elephants." At the Water's Edge was disappointing! At the Water’s Edge by Sara Gruen is an historical novel set during World War II. In February of 1942 Mairi Grant has lost her infant daughter and her husband within a month of each other. Unable to bear living without them she drowns herself in Loch Ness (the lake). It is 1945 in Philadelphia and the war is still going on. Maddie and Ellis Hyde along with their best friend, Hank Boyd are partying it up. They go out drinking and making fools of themselves. Ellis cannot enlist because he is color blind. Hank is flat footed and is also unable to enlist. After making fools of themselves yet again, Ellis’ parents through them out of their apartment. Ellis’ father was a colonel (people call him The Colonel) and he is disappointed in his son. Ellis’ allowance was cut back so they have to live at home (he would never think of working or volunteering for the war effort). The Colonel is obsessed with the Loch Ness monster and took photographs of it. It later came out that the photos were fakes and The Colonel became a laughingstock. Ellis and Hank decide they are going to Scotland to film the monster to show up his father. So the three of them manage to get transport of a supply ship heading to Scotland (going across the Atlantic was dangerous because of German submarines). Hank and Ellis spent most of the trip drunk (of course). They arrive in Scotland and do not understand the attitude of the locals especially at the inn (the owner really does not like them). They are lucky to get rooms for the three of them and are appalled at the food (I do not think they have ever heard of rationing). Even worse the hotel staff does not unpack their belonging or keep their rooms tidy. Hank and Ellis set off each day try and film the monster. Maddie went at first, but she got tired of the cold (and the drinking). Maddie starts offering help at the inn (as long as Ellis is not around). Ellis does not believe in doing menial labor or cleaning up after himself. It is going to be an interesting trip for Maddie, Ellis, and Hank. Do you think they can change? Will they actually see the Lock Ness monster? Read At the Water’s Edge to find out what happens to these three spoiled rich people. At the Water’s Edge was an unusual book. The first part of the book dragged along, but the second half was much better. I give At the Water’s Edge 3.5 out of 5 stars. This book was not at all what I expected. I bet the locals in Scotland wanted to put Hank, Ellis, and Maddie back on a boat to America! There is a great development in the book that I loved (relates to the first paragraph of my review). 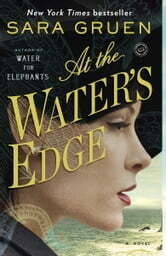 I received a complimentary copy of At the Water’s Edge from NetGalley in exchange for an honest review. The review and opinions expressed are my own.